ISEA 2011 Istanbul Conference was the academic core of the Symposium and took place mainly at the prestigious Sabanci Center’s towers situated at Levent, the rapidly developing and expanding business district of Istanbul. The ISEA2011 Istanbul Conference hosted more than 450 paper presentations, over 70 panels and 60 workshops that were complemented by fora, networking, meetings and special events. All submissions were selected and reviewed by an international jury of professionals and academics from various disciplinary backgrounds. Looking at these tables, we can see how nature is not only capable of creating spontaneous art forms, but also of establishing a direct connection with certain geometric aesthetics, starting from a fundamental unit/core and reaching a more complex entity, as consequent evolutionary practice of adaptation. Those researches were meant to point out the almost computational characteristics of Mother Nature on one hand, while on the other they confirmed the machines’ capability of simulating/replicating complex natural phenomena. Speaking deeply about pure mathematics and numbers, we could consider also the four dimensional Quaternions, discovered in 1843 by Irish mathematician William Roman Hamilton, who was searching for a way to extend complex number on a higher quantity of spatial dimensions. Quaternions find uses today in both theoretical and applied mathematics, in particular for calculations involving three-dimensional rotations in computer vision: exactly what Thorsten Fleisch did in his work Gestalt. As stated by Thorsten Fleisch himself: “Given the fact that a film is the visualization of a mathematical element, it is theoretically possible to render it as high a resolution as technically feasible without losing any detail”. Again, in 1787, the jurist, musician and physicist Ernst Chladni published a book called Entdeckungen über die Theorie des Klanges (Discoveries Concerning the Theory of Sound). With this text, based on experiments on the field and observations, Chladni laid the foundations for that discipline within physics that came to be called “Acoustics”, the science of sound. With the help of a violin bow which he drew perpendicularly across the edge of flat plates covered with sand, he observed how sound waves generate geometric patterns and shapes which today go by the term “Chladni figures”. In 1967, starting from Chladni studies, the Swiss doctor and naturalist Hans Jenny (1904-1972) published the book Kymatik – Wellen und Schwingungen mit ihrer Struktur und Dynamik (Cymatics – The Structure and Dynamics of Waves and Vibration). In the book (and many video-recordings) Jenny carries out all his experiments that shows what happened when someone takes various materials like sand, spores, iron filings, water, and viscous substances, and places them on metal plates and membranes vibrating by specific sound waves. Jenny turned these materials into alive and fluctuating forms, following geometric patterns created by using simple vibrational waves (pure tones) present in the audible field. The artists who paid homage to Cymatics studies was the American composer and musician Alvin Lucier, in the performance called The Queen of the South. Much of his work is influenced by science and explores the physical properties of sound itself: resonance of spaces, phase interference between closely-tuned pitches, and the transmission of sound through physical media. All these examples show clearly how Nature is characterized, at the root, by a matrix of numbers and mathematical expressions subtending a series of physical, optical, chemical-physical, electromagnetic phenomena influencing natural forms, species, colours, sounds and structures. And when we talk about Nature, we intend also those electro-magnetic signals interferences hitting and surrounding the Earth that are the product of turbulences triggered by solar winds, coronal mass ejections and other energetic phenomena on Sun’s surface combined with ionization in the upper atmosphere of the Earth itself. 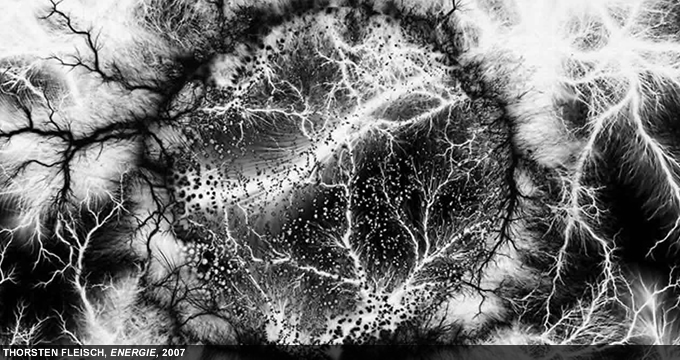 Semiconductor developed a whole part of their artistic career working on audio-visualization of these astronomic phenomena. Recording a series of sound materials, captured with a ELF-VLF radio recorder, a tool capable of converting ground level natural radio signals into sound frequencies, in works such as Black Rain, Brillant Noise and Magnetic Movie, Semiconductor were able to give life to these magnetic fields. If science is considered as a complex of knowledge obtained through a methodical procedure, capable of providing a precise description of the real aspect of things and the laws by which the phenomena happen, and if the rules governing such process are generally called “scientific method”, then the experimental observation of a natural event, the formulation of a general hypothesis about such event and the possibility of checking the hypothesis through subsequent observations, become fundamental elements in modern scientific (and artistic) research. What it is today recognized as “immersive art-science” is a form of creative expression meant to rise above the notion of art as abstract representation, in behalf of a multi-sensorial experience. The historical-critical statement of this lecture, and the Hidden Worlds screening connected to that, is to map those audiovisual artists acting with a “discovery approach”, observing and recording, sharing experiences and ideas with scientists and science communities, working without the use of cinematographic or video or digital tecniques but obtaining the flux of sound and images only by natural and spontaneous scientific phenomena (physical, optical, chemical, mathemical and electro-magnetical). Immersivity awakens a synesthetic awareness, both in the mental and in the physical space. A myriad of vibrant phenomena, usually beyond the observer’s reach, are instead made reachable through an accurate psycho-physical conditioning. A.M.Turing, “The Chemical Basis of Morphogenesis”, Philosophical Transactions of the Royal Society of London. Series B, Biological Sciences, Vol.237, No. 641. (Aug. 14, 1952): pp. 37-72.